Home / 2012 / October / 18 / RED TENT CEREMONIES .. welcome to womanhood! You’ll be ten years old on October 24th! Then you get 40 years (sounds like a lot doesn’t it?) of the motherhood or pro-creative phase in which you can birth either children or your best work in the world. When you stop menstruation after menopause somewhere between 45 and 55; you get the honor of being called a “Crone.” That word comes from the Greek word meaning ‘crowned’ or ‘holy one’ or ‘wise elder woman,’ likes me at 67. It is the stage in a woman’s life when she stands in her own truth and power. 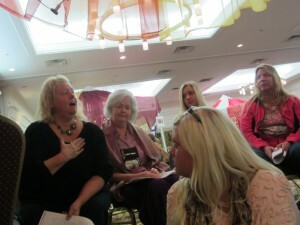 I just got home from a national gathering of 200 women called Crones Counsel in Salt Lake City. 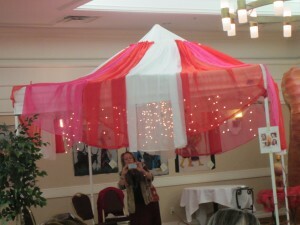 There we attended a RED TENT CEREMONY that prompted me to think of you. In ancient Hebrew times the red tent was a place women were sent when they were bleeding for ritual and rest, some men thinking they were ‘unclean’ at that time. The Counsel built these three beautiful tents with sparkling see-through veils. Groups of younger women were invited and we elders moved with them to each tent to listen and share with one another about the greatest tasks and challenges of each stage. I was particularly moved at the MAIDEN tent when one young teenager, tears in her eyes, shared about guys having it so much easier than girls on looks and appearance. She told us that guys take pictures of girls and post them on a website called ratingmylooks.com, and rate them from 1-10 and make often nasty comments! How awful! How horrible that must make you feel, whether you got a 9 or 10 and were chased by boys for only your looks; or a 2-3 and were laughed at! Anne, I hope that you learn to believe in your own inner beauty when you look in the mirror and at your girlfriends, and not let what others say about you affect you; but I know that won’t be easy. Then I went to the MOTHERHOOD tent. A young woman of 22 with 7-month-old twins and a three year old at home who she loved very much, told us weeping that she was overwhelmed and didn’t think she ever was ‘enough’ for her babies! She wanted to know if we grandmother and great grandmother types had ever felt that way. We all assured her YES! And suggested ways she could ask for help when she needs it. So Anne, I heard these RED TENT CEREMONIES are being held by and for women all over the world to bring women of all ages together. I am sorry I cannot bring you to one, yet. I still vision the day that maybe I will. May your journey to woman hood be a smooth and glittering one, with lots of support from your “girl-friends” and women elders along the way. I love you. Nicely done, Pat! As usual. Thanks for sharing. Your heartfelt work is always an inspiration. Thank you!